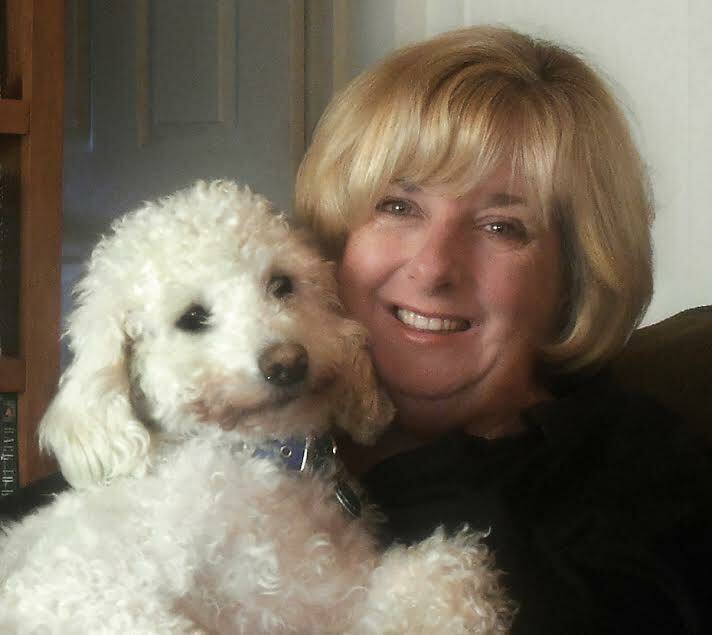 Teaching Authors--6 Children's Authors Who Also Teach Writing: Book Giveaway: For the Love of Toby! 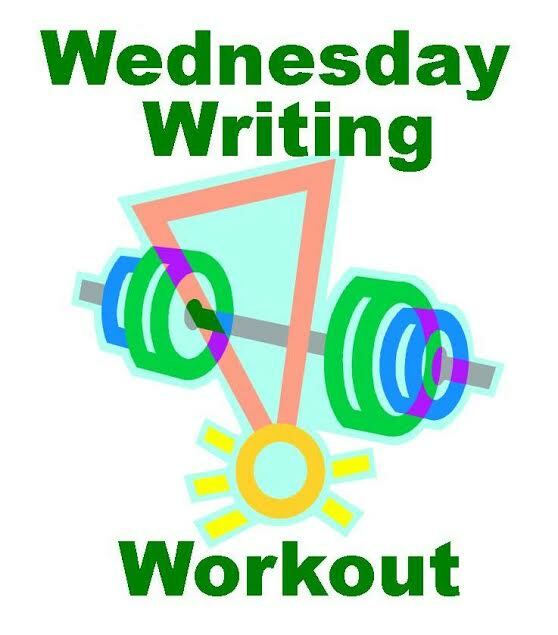 And a Wednesday Writing Workout! Book Giveaway: For the Love of Toby! 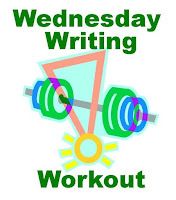 And a Wednesday Writing Workout! 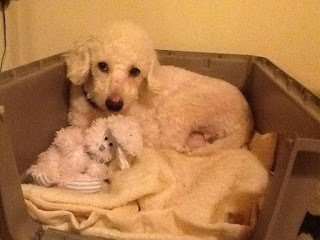 Hazel Mitchell, illustrator extraordinaire, rescued a small poodle born into a puppy mill. Toby needed a lot of love and patience to overcome the tragedy of his birth. For months, Hazel shared her journey with her Facebook friends and family as she worked to heal the puppy’s shattered ego. Finally, Toby accepted Hazel and found his forever home. In 2014, Toby disappeared. What followed was nothing short of a heart-wrenching Walt Disney movie. People from the community and beyond gathered to help Hazel search for the lost Toby. Around the world, others followed the desperate search for Toby. For eight days, we held our breath. When Toby was found, there rose a collective sigh and a standing ovation all for the love of Toby. 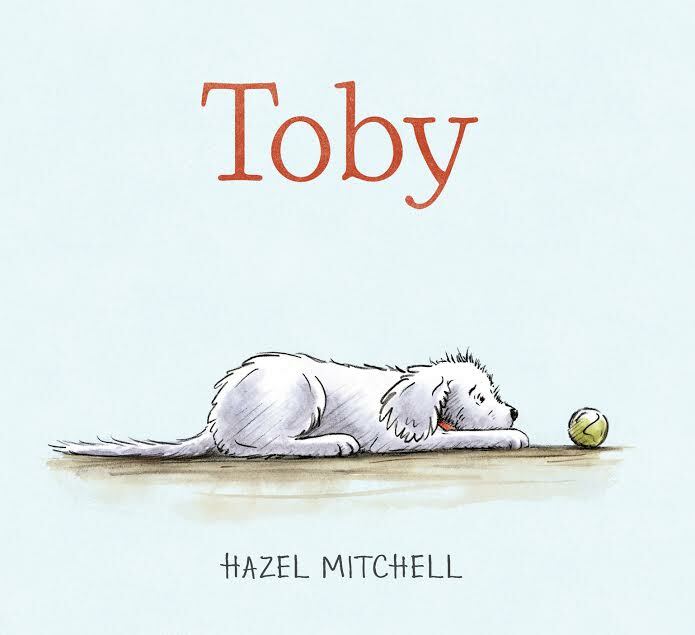 Inspired by this experience, Hazel tells the poignant story of a boy who rescues a puppy named Toby. It’s more than a melt-your-heart read aloud about a boy and his dog, however. As a rescued puppy, Toby can be difficult. He has some bad habits. He doesn’t trust his new family. The story underscores the challenges faced by those who rescue animals, even as it highlights the rewards. Important themes include devotion and patience and, of course, the enduring and endearing love we share with our four-legged family members. "I rescued Toby from an animal rescue shelter in Maine in 2013. Poor Toby had a difficult start in life and when he came to live with us. He was very insecure and frightened. He’d never lived with people in a proper home. He was rescued with eight other poodles from a hoarder situation. So his new was strange to him. Little by little Toby came out of his shell and it was good to see him blossoming. But along the way there were many ups and downs. Sometimes he’d seem to be really progressing and then he would be scared by something and would lose ground again. It was hard to watch his struggles with situations other dogs take in their stride. It was frustrating for us too! As an illustrator, I wanted to capture the emotions of my little waif on paper. I began to sketch him almost as soon as he came to live with us. The more I sketched him the more convinced I became that I wanted to write a story about him. Now, there are very many stories about rescued and stray dogs. How could I make Toby’s story compelling enough to stand up among the many dog books on the bookshelves? A story must have a beginning, a middle and an end. And in picture books the character is often trying to solve a problem. Well, Toby had a big enough problem … how to overcome his fears and become a normal pet dog. Try as I might, I could not find a satisfying story arc about Toby in his everyday real life setting with me and my husband. I felt I needed something more than that to engage with the reader. 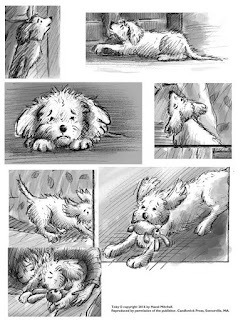 As I drew Toby and moved away from the realistic renderings of him to a looser, more accessible style for a picture book, I began to draw him with a child, a boy. The boy reminded me of a friend’s child back in England. The more I sketched the more I realized that the boy was the secondary character I needed in the story of Toby. A boy who adopts Toby. Now I had a relationship to work with! I brainstormed ideas about the boy, and, after a couple of false starts, I gave the boy a problem he was working through too – he’s just moved to a new neighborhood and he’s trying to settle down and feels lonely. He sees a girl out walking her dog. Then he finds a flyer from the local animal shelter on the doorstep and he sees a picture of Toby. Voila! So that’s how Toby came to have a fictional family. Once I’d created this world around Toby, it was easy to include some of the real things that happened and emotions he went through – hiding, not playing or wanting food, messing in the house and then when he started coming out of his shell – sleeping on the bed, watching for my husband through the window and the less socially accepted incidents like running through flowers and chewing eyeglasses! 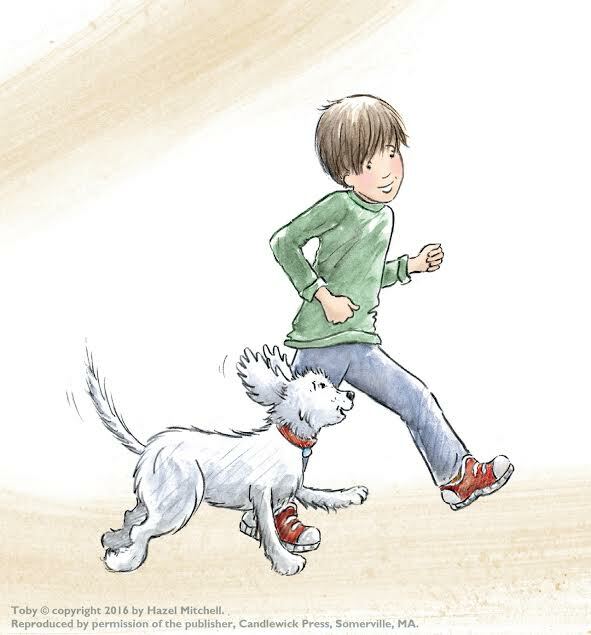 The boy and his dad have to work out how to live with Toby and help him. Ultimately the boy never gives up on Toby and one of the book’s themes is not giving up, patience and persistence." 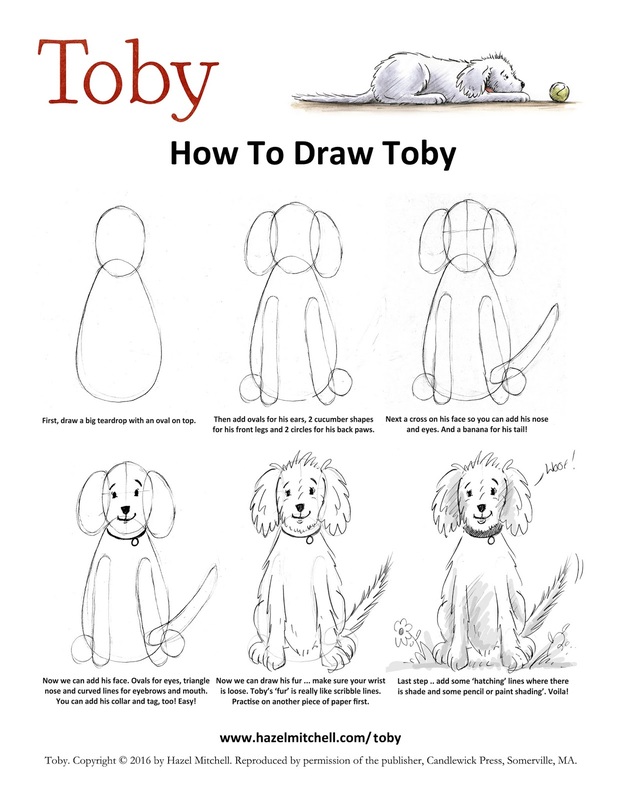 Here’s how you can draw your very own Toby! Do you have a favorite pet story? 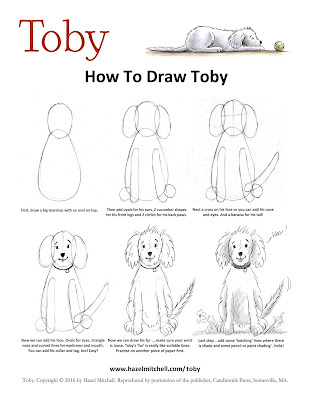 Why not write your very own Toby story. (Don’t worry, if you don’t have a favorite pet, perhaps you have a favorite stuffed toy.) 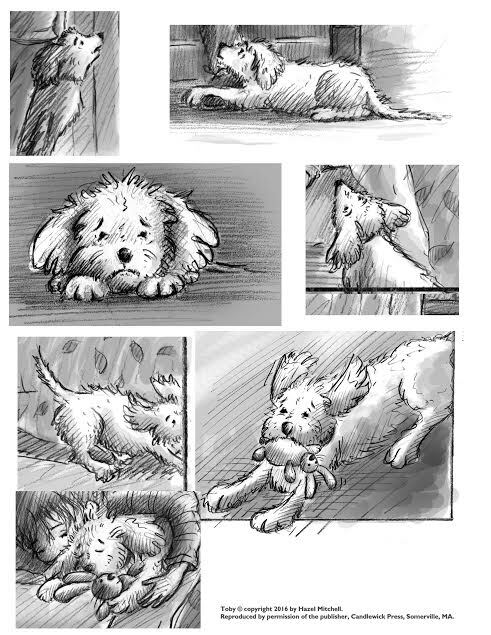 Draw your favorite pet, using Hazel's guidelines, and write a story about them! Share your story with us in the comments below! Join us in our celebration of Toby and all our beloved pets! We have a giveaway! Use the Rafflecopter widget below to enter to win ONE giveaway copy of the new edition of Toby. We also have a swag bag filled with all sorts of Toby goodies! You may enter via 1, 2, or all 3 options. The giveaway ends November 15 and is open to U.S. residents only. What a great story. When we were training our puppy, there was a poodle from a puppy mill in the class. We could see how long a road the family had to go with their pup. But, I hope things went well. This is truly an "underdog" story that more than just kids can love. Nice interview and a super story! I always enjoy reading the story behind the book. Thank you for the drawing Toby exercise. I am a writer, not an illustrator, but I regret not spending more time making visual art. I'm going to work on my drawing skills and, who knows, maybe I can be an illustrator some day. You have a heart of gold. Thank you for sharing Toby's story. I am looking forward to reading your book. I love this story! My dog passed last month and a pet story came to me two days ago so this post hits home. Congrats Hazel! I love Toby's story. And thanks for the drawing lesson! I LOVED reading the behind-the-scenes of this book! I'm inspired at how she was able to incorporate real details and stir them around with imaginary ones to make a GREAT story! My favorite part was seeing her original sketches. 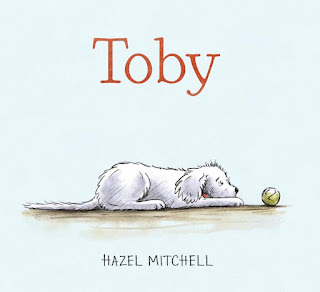 Toby is so cute--the cover just makes me want to take him home. Dogs have always been part of my life--I have a golden retriever that we adopted after he failed his serice dog training. I can't wait to read this heart-warming story. Thank you, everyone, for stopping by. Toby is certainly a superstar among pets. This is such an important book for young readers. I thoroughly loved it, and so will you! Very nice story, best season to read.